Sally Ride appears in an offical NASA portrait in January 1983. Editor's note: Capt. Joan E. Darrah served for nearly 30 years as a Naval intelligence officer, serving as chief of staff and deputy commander at the Office of Naval Intelligence, among other offices. After retirement, she was a leading advocate in the fight to repeal "Don't Ask, Don't Tell" and testified before the House Committee on Armed Services Subcommittee on Military Personnel. Darrah lives with her partner of 22 years, Lynne Kennedy, in Alexandria, Virginia. 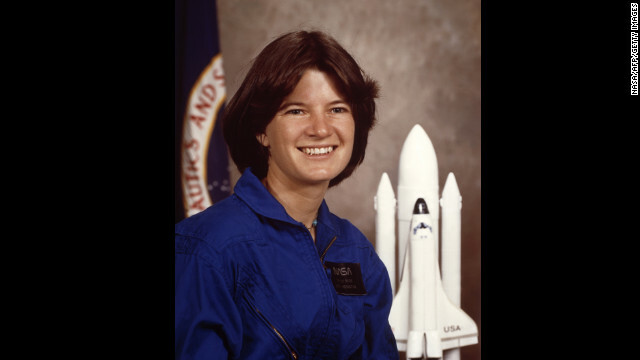 (CNN) - When I heard the news that Sally Ride, the first American woman in space, died after a long battle with pancreatic cancer I was shocked and saddened. She was a woman clearly ahead of her time, blazing trails for all of those behind her, showing other women that it was possible to be smart, to care about science and to be an astronaut. After her death, it was revealed that she was gay, but it didn't totally surprise me. Being a lesbian myself, I admit I was proud to learn that such an accomplished American pioneer and role model was on "our team." Some are saying that she let the gay and lesbian community down, that she should have been more visible and should have publicly declared her sexual orientation. She could have made a contribution to gay rights. She could have inspired many young people struggling with their sexuality. But it isn't that easy. Especially for women like Sally and me, who grew up in the '50s and '60s. I retired from the Navy in June 2002 as a captain after nearly 30 years of living under "don't ask, don't tell" and its predecessor. Once I retired, I knew that I needed to add my voice to the fight against DADT, to be a visible example of a gay service member. However, outing myself beyond my close circle of friends wasn't easy. I was proud of my accomplishments but a big part of me wanted to keep my personal life private.